Minnesota goalkeeper Bobby Shuttleworth leaps to make a save. USA Today Sports. New York City Football Club suffered a 2-1 loss in Minnesota on Saturday night, giving the Red Bulls a first-round bye in the MLS Playoffs. NYCFC fell to 15-8-9, with 53 points, six points behind the Red Bulls (18-5-7, 59 points) with two matches to go and the Red Bulls hold the tiebreaker. NYCFC is five points ahead of 4th-place Columbus (13-9-9, 48 points) and six points ahead of Philadelphia (14-5-12, 47 points). Minnesota got two goals from Angelo Rodriguez in the first half that would prove to be all they needed. 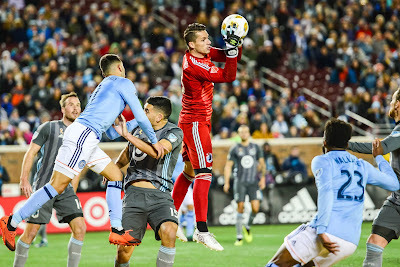 The first one came in the 20th minute when Rodriguez headed in a shot at the back post unchecked from a deep cross by Miguel Ibarra on a breakaway. Darwin Quintero also earned an assist on the play. Rodriguez scored again a short time later, in the 36th minute, when he took advantage of a wayward back pass by the NYCFC defense and buried it to make it 2-0. It stayed that way until the 91st minute when Rodney Wallace gave NYCFC their lone goal of the night. NYCFC had their chances all night, as they poured in 10 shots, 3 of which were on target and had possession for 68 percent of the game. NYCFC Head Coach Domenec Torrent said of the loss, "We had 70 % percent of the ball. In the first half we controlled all the time, but we made two mistakes, which happens in soccer and we paid for out mistakes. Maybe the second half we created more chances, but we controlled the ball well in the first half. I’m disappointed by the result, not by the game. Maybe this was the best game that New York City played away, maybe. My opinion today, is that New York City played really well here in Minnesota. Minnesota played aggressively with us. At the end, we lost the game. That’s not good for us. The performance for me was good. Better than Montreal where we drew the game, and tonight where we lost. It’s not easy to explain to people and our fans what happened. I prefer to always talk about what happened on the field, not the result. Because the result is easy. You win the game, it’ okay. You lose the game, everything is wrong."